It's funny how my internet research on healthful, organic living (for me and Baby G) and on medieval times (for my novel) often overlap. I wouldn't want to live in the "dark ages," but ironically, there was plenty of wisdom and knowledge around at that time that is often overlooked in modern times. Like the medicinal and gardening uses for various essential oils, herbs, and spices. Today, I checked online to confirm what I had heard about the antifungal properties of cinnamon. 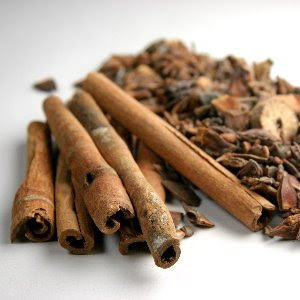 Turns out cinnamon is a good antifungal, as well as a good antibacterial and antiviral agent. This is great news for me, because the roses in front of my house look like hell this summer. The poor things! It's been blazing hot this year. Usually I enjoy the heat, but pregnant, I cannot handle it. On most days I can't be outside for more than five minutes at a time, which means that my gardens have been sorely neglected. I was able to harvest a basketful of potatoes and garlic this afternoon (yay, something edible survived! ), but that was about all I could take. Happily, I may have found a solution to the fungal problem in cinnamon. The moment the temperature drops below 78 degrees, I'll be out there pruning, watering, and sprinkling cinnamon on the leaves. What a yummy treat. Bonus: Cinnamon also repels ants. That's brilliant! I didn't know cinnamon was good for roses. Cinnamon Rose. It sounds like an interesting title. Being the cinnamon-a-holic that I am, I'd be quite drawn to a title like that. Wow, thanks for posting the info about cinnamon. That's really useful. Keri: Mmm, me too. This post made me want a cinnamon roll real bad! Dominique: Yes, garlic is good for so many things, isn't it? :) It's also a disinfectant and immune system booster. However, I must admit that I like it better when my husband gnaws on things like ginger or cinnamon for his health instead of eating raw garlic cloves. That doesn't JUST keep vampires away... it works on wives, too. I never that about cinnamon! Good luck and drink lots and lots of fluids!